The Tidal Wave restaurant was an interesting one. Remias had entered the establishment a while ago, and was already halfway through the fish she’d ordered for lunch. As she ate, she thought about the peculiarities of the restaurant; specifically the various submerged areas that lined the aisles and some of the table space. Mioka waiters moved skillfully under small bridges that connected sections of the restaurant’s azure floor as they ferried their dishes to and from the kitchen in the back, without getting a drop of water on them. It helped that the trays they were placed on were water tight, not letting most things inside, let alone water. Of course, there were also special orders that were allowed to be submerged, specifically for the underwater races like mioka and rulevath who ‘sat’ at the underwater and partially submerged tables. As she thought about this, a mioki waitress coincidentally approached her from a nearby waterway. She was tan skinned mioki with flowing sea green hair and a small handful of freckles on her face, wearing a waitress uniform that that consisted of a scarf tied in a somewhat bulky, yet aesthetically pleasing way, as well as a simple shirt and skirt that were soaked from traveling through the water. Her tail was the same color as her hair, and ended with it’s two tail fins curving toward each other, forming a circle in the space between them. She wore a small rectangular nametag with “Aeris” written on it. 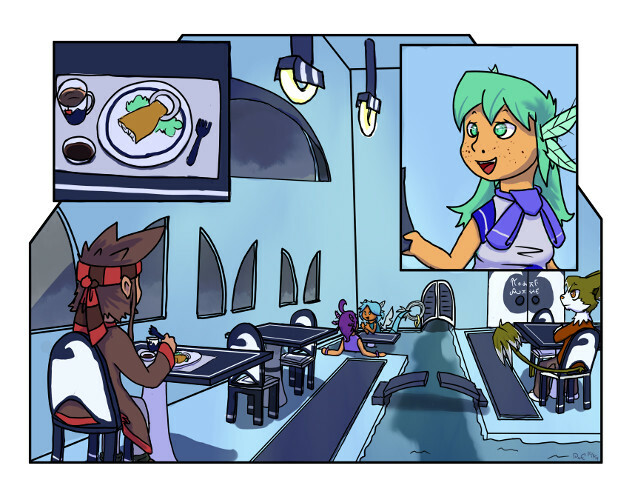 “Pretty good,” Remias said after swallowing another piece of her fish, “I’m curious though, Do most restaurants in Venesque have this layout? With these canals I mean.” She gestured to the water the mioki was wading in with her fork. “Umm, not any of them I’ve been to…!” Aeris said, stepping out of the water to the table. Remias looked to the people two tables in front of her, two mioki who were just chatting rather loudly. Their table was somewhat submerged, as were they, not that they minded as they continued their frivolous discussion. Remias finished of her fish. “I can see that,” she said after swallowing. Before she could launch into her riveting tale, one she frequently told anyone who would listen, a large groups of shouts suddenly erupted from the back of the kitchen. As the backroom staff were shouting, a small blue animal ran out of the kitchen into the canal with a stolen fish in it’s mouth. It had large circular ears that were transparent in the middle, as well as a lure that ended in a bulb that glowed softly. It’s webbed feet were dark blue, as was the end of its tail fins. The other diners took notice, wondering if they should do anything as the creature, an ekuell, swam toward Remias and Aeris. Right as she got to the edge, the ekuell leaped out of the water with an unexpectedly large splash. The fish was gone, presumably eaten underwater as if it had done a magic disappearing trick. It was too slippery for Aeris to catch under the torrent. Without warning, the ekuell landed on Remias’ table, right on top of the bill. It would have been a water soaked bill if it wasn’t already made of water-proof paper. Remias however was not so lucky, and while not soaked, did manage to get a little wet. She was also paralyzed with confusion. “Ahh, Aebi! Stay right there! !” Aeris said, ash she quickly made her way back to the table. As she approached she slowed down to a tip toe, keeping her eyes on the ekuell, who’s eyes followed her with equal focus. Suddenly, Aeris lunged at the ekuell, who swiftly dodged out of the way, almost knocking over the food on the table onto an unsuspecting Remias. Remias herself sprung out of the chair to avoid getting her clothes even more messy, silently lamenting over the fact that the food had been totaled while Aeris repeatedly made grabs at the ekuell. Finally, after about 10 tries, she’d finally managed to trap it in her arms. Aeris froze, he eyes growing wide. She turned to Remias slowy. “…I’ll be right back.” she said, dread dripping from her voice as she moved quickly to the kitchen. Remias looked at where she’d gone, and then back at her food, and made a weak shrugging motion. Giving up on her search, she sat back down in the chair opposite her that had miraculously avoided getting soiled, and waited for Aeris to return. After some time had passed, with lots of muffled shouting behind the closed door to the back of the restaurant, a disgruntled mioki finally emerged with cleaning supplies in her hands. She briskly made her way back to Remias, head down, and with the ekuell that had caused them so much grief safely bound by a bubble incased in ice between her tail fins. She looked back at Aebi, who seemed oblivious to the whole situation as he was held taught in the frosty bubble, and sighed. Aeris hung her head, as she started cleaning the mess she and Aebi made earlier. “…What?” Aeris said, looking at what was in Remias’s hand. She’d offered her a small tip. Aeris blushed, hesitant about actually taking it, while Aebi desperately tried to look behind him to see what was going on. With her time at the restaurant finished, Remias headed for he door. The request never reached Remias’ ears; she had already left.